Neil Lennon is desperate for luckless midfielder Dylan McGeouch to enjoy an injury-free run so he can truly start fulfilling his potential at Hibs. The midfielder has been plagued by fitness issues throughout his career and is currently sidelined by a niggling hamstring problem which has stopped him generating any momentum this season. 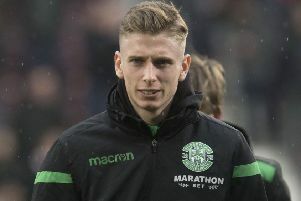 After starting four consecutive matches, the 23-year-old was ruled out of last Saturday’s goalless draw at Raith Rovers when the issue flared up again. He is set to sit out today’s trip to Dunfermline, with Lennon revealing he may need a period of rest to banish the problem once and for all. “Dylan is still struggling,” said the Hibs manager. “It just seems to be a recurring problem at the top of his hamstring. We may have to give him more time to get it right. He felt strong enough to come back and play in a few games, but he felt it go again last week. We will assess it with the medical team but I don’t think it’ll be long-term. After having his hopes of establishing himself at boyhood club Celtic dashed by injury, McGeouch, who was one of the most highly-rated players of his generation as a teenager, has continued to be bothered by fitness problems since joining Hibs, initially on loan, just over two years ago. In his first season at Easter Road, he had a spell sidelined by an ankle issue, then last season he was afflicted by pain in his groins. His hamstring problem this season has restricted him to just seven starts in 14 games. Lennon, who gave McGeouch his Celtic debut, would love to see the midfielder benefit from a sustained period of fitness. “It is heartbreaking and frustrating for him,” he said. “He hasn’t really had a consistent run in his career and maybe he just needs to do more gym work, core work, whatever it is, to solidify that area. At the minute he hasn’t been able to get a consistent run of games together.